Donald Trump was already embroiled in legal and political challenges to his decision earlier this month to declare a national emergency at the southern border. Now, he’s facing a new wave of pushback—this time, from a bipartisan group of 58 former national-security officials, who on Monday are expected to release a declaration condemning the maneuver and backing lawsuits aimed at blocking the workaround. 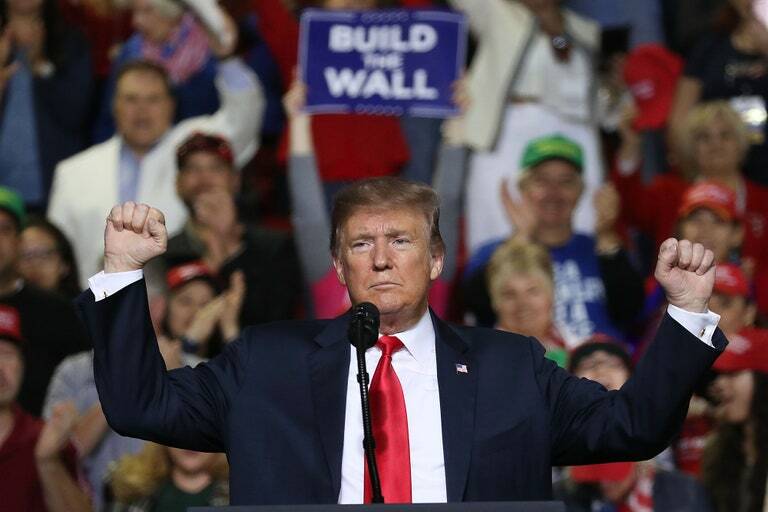 “Under no plausible assessment of the evidence is there a national emergency today that entitles the president to tap into funds appropriated for other purposes to build a wall at the southern border” the group wrote, according to The Washington Post,adding elsewhere that there is “no factual basis” for the move. The joint statement was signed by former secretary of state Madeleine Albright and former defense secretary Chuck Hagel, who served in Bill Clinton’s and Barack Obama’s administrations, respectively, as well as an array of prominent figures who served under both Democratic and Republican presidents. It represents still more opposition to the president’s contentious move, and is particularly humiliating for the administration given the source. But having nearly 60 of the country’s most prominent national-security experts tear into Trump isn’t just an embarrassment for the White House; the declaration could also prove handy for those attempting to block the nuclear option. Several states have already joined a lawsuit filed by California against the administration. Democrats are planning their own lawsuit, and are expected to vote on a resolution by Rep. Joaquin Castro to “terminate this emergency declaration.” That resolution will almost certainly pass the Democratically controlled House, and possibly even the Senate, where Republican Susan Collins has already announced her support. The measure is likely to die with Trump’s veto, but its defeat would represent a temporary victory. As even he predicted in a rambling Rose Garden address, the legal path forward for the president’s emergency declaration is a difficult one. “We will have a national emergency, and then we will be sued,” Trump said February 15. “And we will possibly get a bad ruling, and then we’ll get another bad ruling. And then we’ll end up in the Supreme Court, and hopefully we’ll get a fair shake.” It remains to be seen how the national emergency will hold up in court, but Trump has already presumably hurt his own case by saying he “didn’t need to do this,” and that he “could do the wall over a longer period of time,” but wanted it built “much faster.” That the move is being condemned by the most prominent national-security officials in the country likely won’t do him any favors, either.